Spider Man: Edge Of Time! The latest in the long-running Spider-Man series of video games has arrived as a sequel to "Shattered Dimensions", but will Edge of Time be able to attract more attention of gamers then its previous installment did? A Time Traveling Journey: Spider-Man: Edge of Time is the second title developed by Beenox (the first being "Shattered Dimensions") but does not have too many ties to the first title. The story begins with Peter Parker/Spider-Man being killed by "Anti-Venom", who is under the control of a scientist named Walter Sloan. Sloan originally lives in the year 2099, but travels back in time to use his knowledge to establish his company in the past, recreating the world in his image. Meanwhile, soon before Peter Parker is killed, Spider-Man 2099 (Miguel O'Hara) attempts to save Parker from death as well as stop Sloan from changing the world. Spider-Man 2099 and the normal Spider-Man then attempt to work together to save not only themselves but also restore the normal timeline of the world. Edge of Time has a fairly complex storyline that involves a lot of time paradoxes and "this timeline, that timeline" discussions, but it is explained pretty well in the game and is not really confusing. Obviously outlandish and untraditional, but I do not see much of an issue with the storyline and think it is intriguing enough to keep players interested. Add in a couple of twists and I think the plot is pretty entertaining overall. The Amazing(ly conditioned) Spider Man: On the other hand, the gameplay in Edge of Time is actually pretty traditional and is truthfully nothing you probably haven't already seen before. Revolving around hordes of enemies and a lot of button mashing, this title plays out like your typical "beat 'em up" type of game. From early in the game you will have countless enemies thrown at you and your best course of action is relentless offensive attacks as you fly from foe to foe. 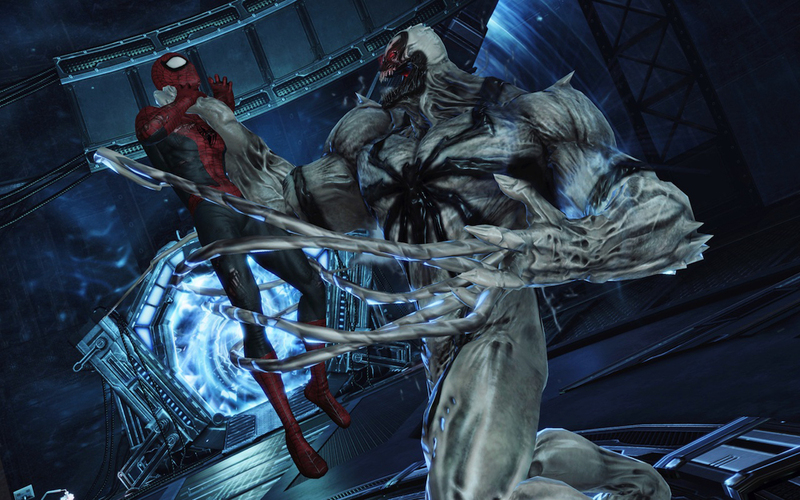 Neither Spider-Man nor Spiderman 2099 have a lot to offer when it comes to unpredictable attacks or special moves. The exception is a "Time Paradox" mode (where your enemies freeze or slow down) and a special mode for both Spider-Man and Spider-Man 2099. The original Spider-Man's ability is a "hyper-speed" or "accelerated" mode where you basically move around at warp speed. Spider-Man 2099 has the ability to launch a decoy version of himself that lets him unexpectedly attack enemies or fool sentry guns into hitting the decoy while the real version escapes. Other than using those attacks, you will basically just rely on mashing the "melee" and "ranged attack" button over and over until everyone has fallen. At first the combat is pretty fun, as most beat 'em up titles are, but over time you will begin to feel the repetitiveness of the combat set in. Not Your Best Work Webhead: As far as everything else goes, Edge of Time has decent visuals but considering the style of the game (multiple enemies on screen constantly), you can't expect detailed surroundings or jaw-dropping graphics. The cinematics look good, but are infrequent for the most part. The voice acting in the game, a pretty big part of this title, is solid though and both Josh Keaton (Spider-Man) and Christopher Daniel Barnes (Spider-Man 2099) do a great job with the voice acting and as a matter of fact, both men have lent their voices to characters in the Spider-Man universe in the past. Rent vs. Buy: Spider-Man: Edge of Time is what it is, and there's no getting around that unfortunately. The storyline is good, as is the voice acting, but the gameplay leaves a lot to be desired. As I mentioned earlier, Edge of Time's gameplay has a repetitiveness that sets in and makes combat pretty boring, especially considering you fight waves of enemies seemingly at every turn. This game has some things going for it such as the plot (which can be interesting and offers some unexpected twists as well) in addition to the voice acting but if you're a fan of beat 'em up titles, I think you will have trouble getting into Edge of Time. Nearly everything about Edge of Time is well done, but the fact that you square off with countless enemies time and time again, using the same attacks over and over eventually wore on me. The upgrade system that is in place does little to ease the boredom either, as the upgrades are pretty minimal and don't inject nearly enough excitement into the game to keep the combat entertaining. If you are somebody who doesn't get bored easily or are immune to titles with gameplay that is very old in design (see a ton of enemies, punch them until they are gone), I can say renting this game will do no harm. But I don't think Edge of Time offers nearly enough to warrant a purchase, unfortunately.